"The Quest for Cosmic Boy: Prologue"
Brainiac 5 is dreaming about being a hero the people of earth look up to, when he's visited by Dream Girl who warns him that the Legion has reached a turning point and "something big is unfolding". She means to give him some advice about all of this, but before she can Brainy is awakened by Star Boy with the election results. So who's the new leader? Surprising no one (or certainly not me), it's Supergirl. Kara, however, is unaware of the election results as she flies around the world rescuing people from the recent robot/Dominator trouble. A special prosecutor for the United Planets Department of Justice, Tenzil Kem, pulls a Lois Lane and flings himself from a building in order to get Kara to rescue him. He's got business with Kara as the new leader of the Legion, which comes as a total surprise to her (for the record, she won the election as a write-in candidate with 54% of the vote). To no surprise, this doesn't sit well with Mekt. 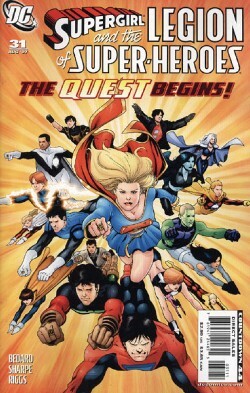 In the Metropolis Convention Center, Supergirl calls a meeting of all the Legion members, Wanderers and Sun Boy's team and offers them all Legion membership as they all worked together to stop the Dominators and she'd rather they worked together than competed with each other, especially since they're still searching for Cosmic Boy. She also announces that the U.P. sent Tenzil Kem to investigate whether or not Cosmic Boy was guilty of war crimes for his perceived actions in stopping the Dominators. Mekt tries to stage a bit of a rebellion, but Brainiac 5 goes to Supergirl with information on three locations that Cosmic Boy might be found. She's hesitant to listen to him at first, but eventually comes around. As tensions between Mekt and Sun Boy rise, Supergirl stops them with a threat and sends small groups off on missions to Brainy's three locations, in search of Cosmic Boy. Some of the Legion members are wary of Brainy's plan, knowing they're almost never what they seem. Timber Wolf, Shadow Lass and Shrinking Violet meet resistance at their destination from people thinking they were hired assassins, while the actual assassins watch on and plan to use them as a distraction. Supergirl, Saturn Girl and Lightning Lad are at the second location, and Lighting Lad mentions his suspicions that Brainiac 5 chose the mission teams and not Supergirl, and set them up for some ulterior motive. Supergirl insists she chose the teams, and Saturn Girl finds it funny that Kara actually believes that. And it's revealed the three of them are being watched by... an orange guy with a big head, who laments at their predictability and says he'll miss them when they're gone. The third team, consisting of Mekt, Sun Boy and Star Boy head to the third location... and run into one Tenzil Kem, who thinks perhaps Mekt had some of the Wanderers kidnap Cosmic Boy and is determined to find out the truth. Story - 4: I wasn't at all surprised with Supergirl winning the spot of Legion leader, but that's not to say I found the outcome predictable. Rather I found it the exact conclusion to the story Waid had been setting up, and so it served its purpose. It also makes the title of the book more fitting, and it moves Kara into a more prominent and starring role. Bedard picked up well from where Waid left off, which is probably helped by the fact that they worked together on several of the previous Legion issues. The book does seem to be lacking a certain punch at this point, though... that barrel-of-fun tone that Waid captured with these kids so well. The tone was a lot more serious, but that's not necessarily a bad thing. It just is, and it may better serve the story he's going to tell. We'll find out before long. We got to see a good number of the Legion, which is always nice, especially some who've been relegated to barely more than cameos for a long time. I'm not quite sure how Tenzil Kem got to Winath before Mekt's team, but there are teleporters so it's not inconceivable that he could have gotten there first, especially if he's working with Brainy. What's most important to note about this issue, as far as I'm concerned, is Kara. She has a much bigger role in this issue than she's had in most of the past issues, and she had leadership thrust upon her and, although a little shaky, handled it well and came off strong and intelligent. This of course makes me anticipate Mr. Bedard's run on the actual Supergirl book, because we could certainly use some of that over there! But it also presents another problem in that, when Waid was writing Legion, I couldn't see how the Supergirl in "Legion" could return to earth and be the same Kara in "Supergirl", because the characters were nothing alike. Now that's moved from "I can't see how they can be the same character" to "there's NO WAY they can be the same character". It is literally quite unfathomable to me now how the Kara of "Legion" can be intelligent, strong (of character) and start to blossom in a leadership role and then return to be the Kara of "Supergirl" who has no direction, no character and does nothing beyond chasing boys and whining. There's a severe disconnect there, and I don't know how it can be reconciled. However, at this point, I'm so happy to have a Kara I can respect that I don't even care. If the Kara in "Supergirl" changes to mirror the Kara in "Legion" in terms of character, I'm willing to overlook the worst of reasons, or the complete lack of reasons, simply to get her to where she needs to be. Right now, as far as I'm concerned, there's only one Supergirl in the DCU, and she lives in "Supergirl and the Legion of Super-heroes". Art - 3: It's not Kitson, but I have to try and judge it on its own merits... and that's where I find it hits directly in the middle of the road. There are some great moments (the giant robot on page 2, the floating Kara in the first panel on page 9) and some awful moments (the first panel on page 5... who knew Dream Girl was sleepy? The close-up on Kara's face on the bottom of page 14... what the heck happened to her lips?!) and so I'll call it right down the middle of the road and see what develops in future issues. Cover Art - 5: Uh, yeah. Poster please! Thank you.